AP Yuva Nestam Registration:- The Educated Unemployed People of Andhra Pradesh will get a Sigh of Relief after Reading this News. AP CM Yuva Nestam Online Registration for The 2018-19 Year has Started Now. If You are Unaware With the Yuva Nestam Scheme then Let us Explain that it is an Unemployment Allowance Scheme also known as Nirudyog Bruthi Scheme. Under this Scheme, the Graduated Youth of Andhra Pradesh can Avail this AP Yuva Nestham Scheme Offer. Online AP Yuva Nestam Registration Process has Began from 14th September. If You have not Registered yet Then Hurry up Before the Last Date for AP Yuva Nestam Registration Online at Official Website. Check out the Mukhyamantri Yuva Nestham Official Website. Nirudyog Bruthi Registration & Eligibility Criteria for AP CM Yuva Nestham Mission. Also, the Description is Stated Below. Under this scheme, the Youth will get Rs. 1000/- Per Month & Skill Development Training by the Team Until They will Get a job. 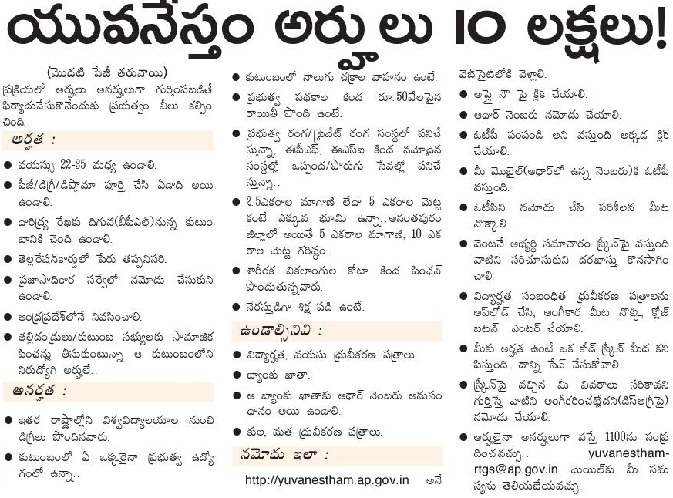 Nirudyog Bhruti Scheme in Andhra Pradesh will Benefit More than 10 Lakh People of AP. There are Certain Terms & Condition Which We Call Eligibility Criteria to Avail the Offer. Let’s check it below. ➥ The Person Must be Graduation Qualified At-Least. 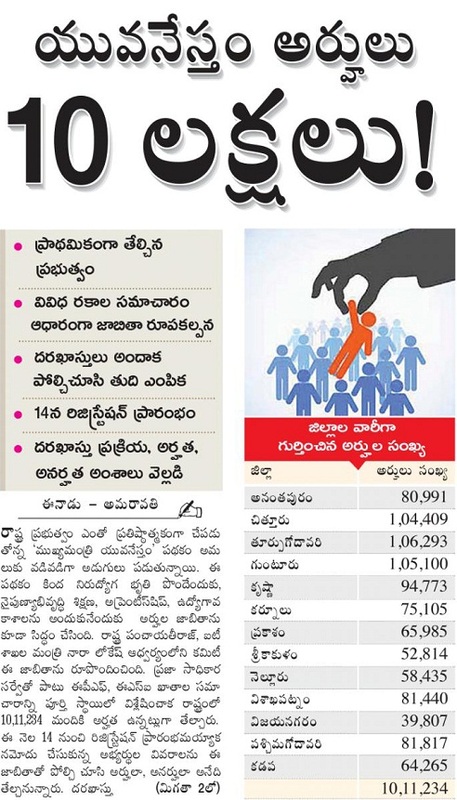 ➥ Only Andhra Pradesh native people can apply for the scheme. ➥ Age limit must lie within 22 to 35 Years for AP Nirudyog Bruthi Registration. ➥ People Who Already Get the Benefit of Financial Assistance/Loan under any State/Central Government Sponsored Self-Employment Scheme are not Eligible. ➥ Private Sector, Govt & Quasi govt or Self-Employed Candidates Cannot Avail for Mukhyamantri Yuva Nestham Allowance. ➥ Person having Movable/Immovable Properties, having 4 Wheelers Cannot Apply for this. ➥ Criminal Offense Should not be there on the Applicant. From Above Details you finally know for You are Eligible for the Yuva Nestham Registration or not. You are then here are the steps by which you can Apply Online For AP Mukhyamantri Yuva Nestham Application Form. ✽ Open Mukhymantri Yuvanestham Official Website. ✽ You will see AP Yuva Nestham “Apply Now” option. ✽ Hit your cursor on it. ✽ In the Register / Login Here option “Enter Aadhaar Number”. ✽ An OTP will be sent to your Mobile No. linked with Aadhar Card. ✽ In Case of any Issue with Registering Aadhaar No. or OTP not Received the dial 1100 – People First Toll Free number. ✽ Continue with the Form by Uploading Required Documents Scanned Copy. ✽ Now you can Press the Register Button. ✽ You can Login anytime with the Registration No. & Password at the Official Website. Note – Allowance Amount of Rs. 1000/- will be credited every month in the first week of every registered candidate account. The individual can opt for online Android App, IOS App & laptop etc. The user manual for the registration guidelines is given in the links corner below. The officials have disclosed the last date to avail the Yuva Nestham scheme. 25th October 218 is the final last date to register for Mukhyamantri Yuva Nestham Official Website to get Rs. 1000 as unemployment allowance. This timeline will not exceed by the official so make sure to hurry up for the registration. Those who will not provide correct details will have to face form rejection. ✦ Mobile Number Linked With Aadhaar. ✦ Original or Xerox copy and image of Diploma/Graduate/Post Graduate Certificates. To Enter the Register/Hallticket Number Available in Certificate. A Toll-Free helpline number is allotted for special assistance for the people. On the AP Yuva Nestham Helpline No. people can ask for the Registration process, issues related to online registration, document details, scheme benefits etc. The unemployment allowance scheme is available before the last date only. Check out the no. on which individual can contact for the help.